As the most pressing resource, water holds the strategic key to peace, public health and prosperity. The battles of yesterday were fought over land. Those of today are over energy. But the battles of tomorrow will be over water. And nowhere else does that prospect look more real than in Asia. According to a 2006 U.N. report, Asia has less fresh water than any other continent other than Antarctica. In that light, water is emerging as a key challenge for long-term Asian peace and stability. Although water covers two-thirds of Earth, much of it is too salty for use. Barely 2.5 percent of the world’s water is potentially potable, but two-thirds of that is locked up in the polar icecaps and glaciers. So, less than 1 percent of the total global water is available for consumption by humans and other species. These freshwater reserves are concentrated in mountain snows, lakes, aquifers and rivers. Already, 1.5 billion people lack ready access to potable water, and 2.5 billion people have no water sanitation services. In Asia, deforestation, poor management of river basins, environmentally unsustainable irrigation, overuse of groundwater and contamination of water sources have all helped aggravate water woes. The over-exploitation of subterranean water has resulted in a falling water table in several parts of Asia. Depleting groundwater irreplaceably can dry up wetlands and lakes that depend on such sources. Saline seawater can flow in to replace the fresh water that has been pumped out, as is happening in some Asian coastal areas. In the Gangetic Delta, wells have tapped into naturally occurring arsenic deposits, leading to tens of millions of people in eastern India and Bangladesh being exposed to high levels of arsenic in drinking water and staple agricultural products like rice. In fact, access to water illustrates the divide today between the rich and the poor in Asia. While the poor struggle to get basic access to water for their daily consumption and household chores, the rich now largely rely on bottled drinking water. The quality and quantity of available fresh water indeed is becoming a critical component of Asian security-related challenges. Increasingly, dams built on transnational rivers are spurring interstate friction. If wars in the future are to be averted over these and other hydro-engineering projects, international norms and rules will have to be evolved. With the world’s fastest-rising military expenditures, most-dangerous hot spots and fiercest resource competition, Asia appears as the biggest flash point for water wars — a concern underscored by attempts by some states to exploit their riparian position or dominance. Riparian dominance impervious to international legal principles can create a situation where water allocations to co-riparian states become a function of political fiat. Upstream dams, barrages, canals and irrigation systems can help fashion water as a political weapon — a weapon that can be wielded overtly in a war, or subtly in peacetime to signal dissatisfaction with a co-riparian state. Even denial of hydrologic data in a critically important season can amount to the use of water as a political tool. Such leverage could in turn prompt a downstream state to build up its military capabilities to help counterbalance the riparian disadvantage. Except for Japan, Malaysia and Burma, Asian states already face water shortages. The very future of some low-lying states like Bangladesh and the Maldives is at stake due to creeping saltwater incursion, frequent storm-related flooding and the climate change-driven rise of ocean levels. Bangladesh today has too much water, yet not enough to meet its needs. Born in blood in 1971, the world’s seventh-most populous nation faces the specter of a watery grave. China and India already are water-stressed economies. The spread of irrigated farming and water-intensive industries and a rising middle class are drawing attention to their serious struggle for more water. The two giants have entered an era of perennial water shortages, which before long are likely to parallel, in terms of per capita availability, the scarcity in the Middle East. Their rapid economic growth could slow in the face of acute water scarcity if their demand for water continues to grow at the present frenetic pace. Water shortages indeed threaten to turn food-exporting China and India into major importers — a development that would seriously accentuate the global food crisis. Even though India’s usable arable land is larger than China’s — 160.5 million hectares compared to 137.1 million hectares — the source of all the major Indian rivers except the Ganges is the Chinese-held Tibetan plateau. This is the world’s largest plateau, whose vast glaciers, huge underground springs and high altitude have endowed it with the greatest river systems. Almost all the major rivers of Asia originate there. Tibet’s status thus is unique: No other area in the world is a water repository of such size, serving as a line for much of an entire continent. 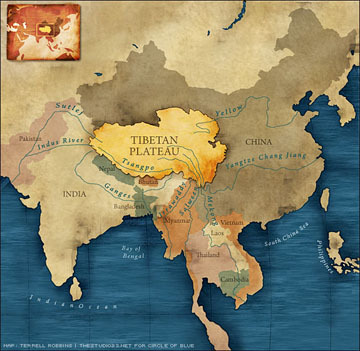 Through its control over Tibet, China controls the ecological viability of several major river systems tied to southern and southeastern Asia. But today, China is toying with massive interbasin and inter-river water transfer projects starting from the Tibetan plateau. Its ongoing "Great South-North Water Transfer Project" is an overly ambitious engineering attempt to take water through man-made canals to its semi-arid north. The diversion of waters from the Tibetan plateau in this project’s third leg is an idea enthusiastically backed by President Hu Jintao, a hydrologist who owes his swift rise in the Communist Party hierarchy to the brutal martial-law crackdown he carried out in Tibet in 1989. In the stark words of Premier Wen Jiabao, water scarcity "threatens the very survival of the Chinese nation." But in seeking to address that challenge, China’s gargantuan projects threaten to damage the delicate Tibetan ecosystem. They also carry seeds of inter-riparian conflict. The hydropolitics in the Mekong River basin, for example, can only become worse as China, ignoring the concerns of downstream states, completes more upstream dams on the Mekong. While making halfhearted attempts to staunch Indian fears about the prospective diversion of River Brahmaputra northward, Beijing has identified the bend where the Brahmaputra forms the world’s longest and deepest canyon, just before entering India, as holding the largest untapped reserves for meeting China’s water and energy needs. A Sino-Indian conflict over the sharing of the Brahmaputra waters would begin no sooner than China began to build the world’s largest hydropower plant on the river’s Great Bend. Asia will continue to have the largest number of people without basic or adequate access to water. Such water stress in the face of rising demand and poor water management will sharpen competition between urban and rural areas, between neighboring provinces and between nations. As global warming accelerates, local, national and interstate disputes over water will become increasingly common in Asia, making cooperative institutional mechanisms over water resources essential within and between states. Clearly, the way to forestall or manage water disputes in Asia is to build cooperative river-basin arrangements involving all riparian neighbors. Such institutional arrangements ought to center on transparency, information sharing, pollution control and a pledge not to redirect the natural flow of transboundary rivers or undertake projects that would diminish cross-border water flows. The successful interstate basin agreements (such as over the Indus, the Nile and the Senegal rivers) are founded on such principles. In the absence of institutionalized cooperation over shared resources, peace would be the casualty in Asia if water became the new battleground. In the ominous words of Wang Shucheng, China’s former minister of water resources: "To fight for every drop of water or die, that is the challenge facing China."